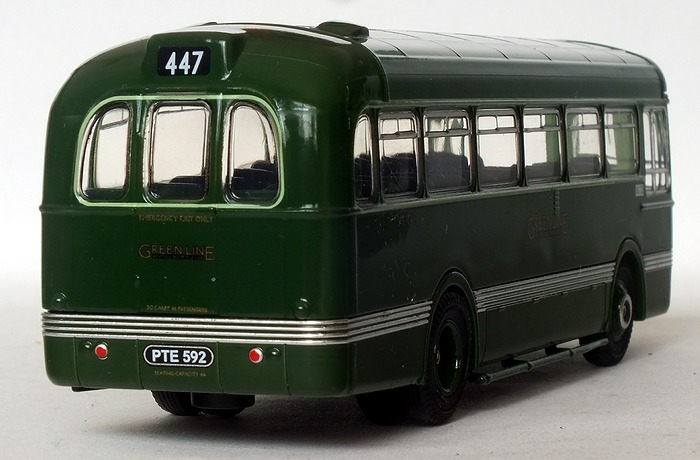 The original sanction from the BTC allowed for 779 vehicles so in the early 1950s attention was turned to a possible acquisition of further buses. 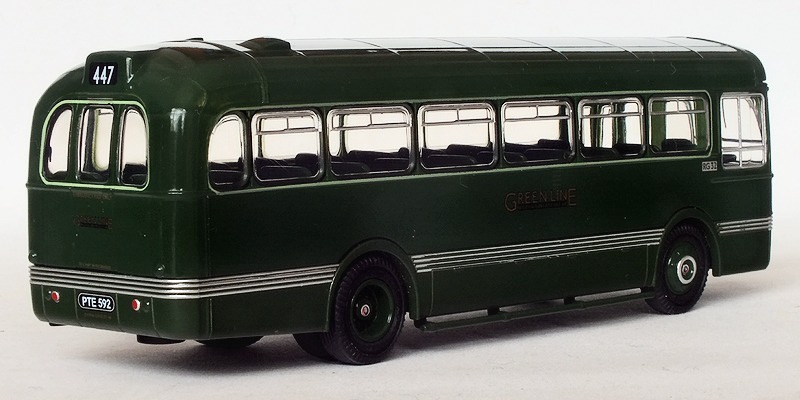 The RF was a sturdy and heavy vehicle with a 9.6 litre engine, virtues which were to be appreciated in later years when newer buses were far less reliable. Some RFs were to remain in service until the late 1970s. 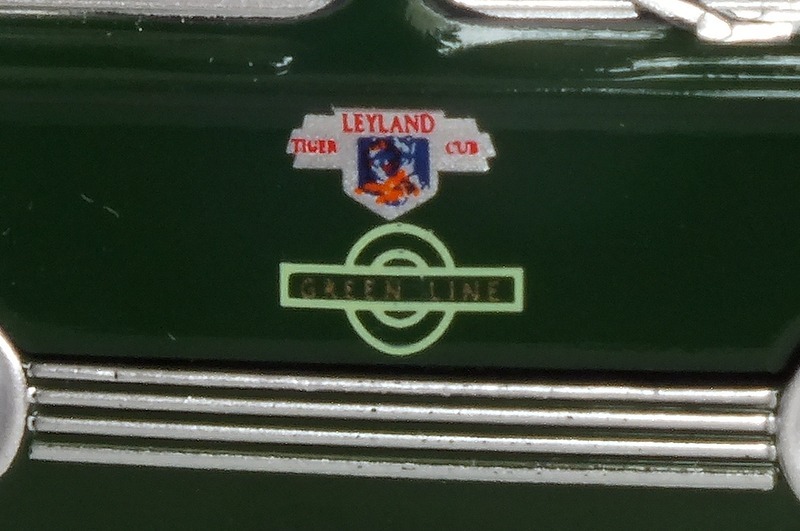 However thought was given to lighter vehicles with smaller engines in the hope that they might be more economic to operate. 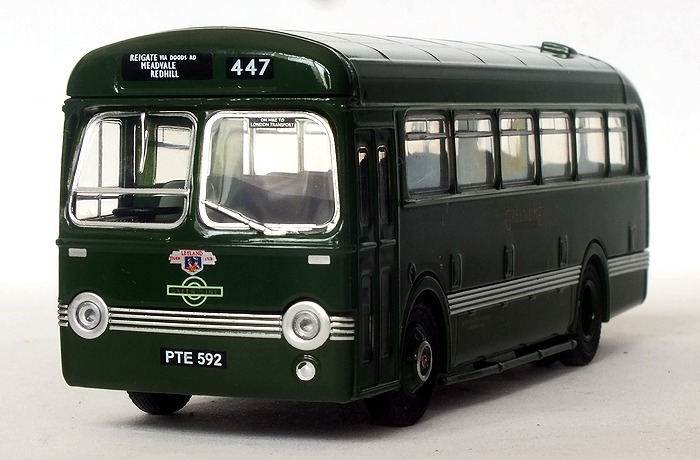 In 1953 trials were made of three vehicles: a Bristol LS, an AEC Monocoach and a Leyland Tiger Cub with a Saro body. 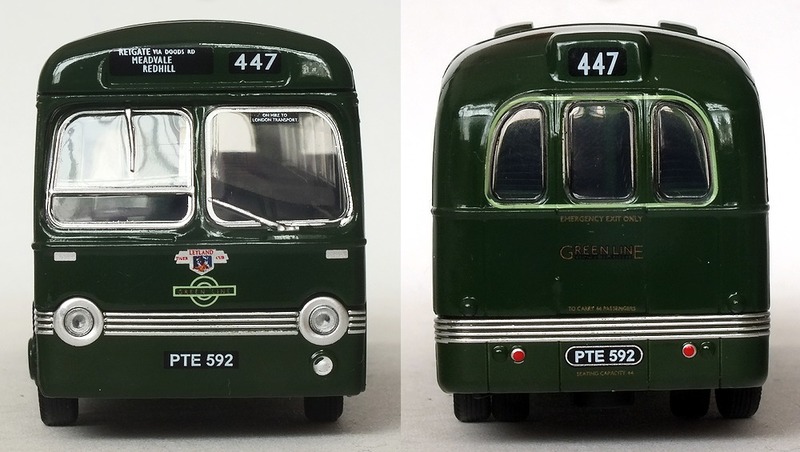 All were painted green and initially they were allocated to Reigate garage where they operated on route 447 and Green Line route 711. 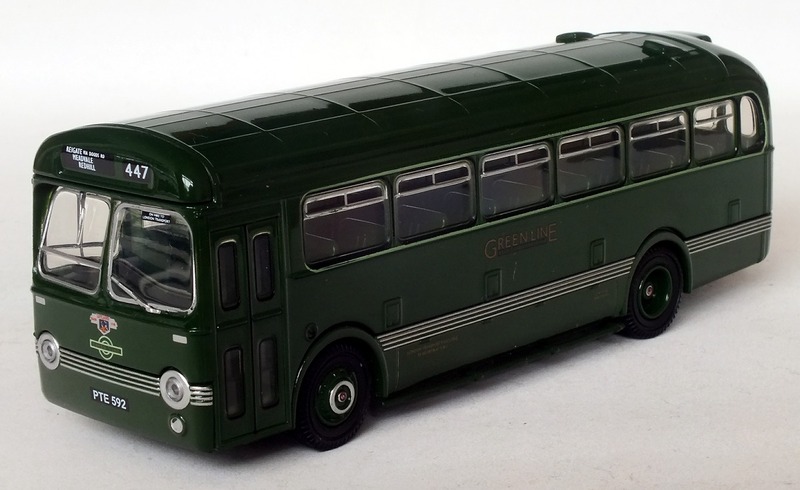 Later they moved to Dalston, and although still painted green, operated on route 208. It was thought that there might be a need for additional buses for route extensions and for services in some of the new towns. A re-assessment of the need was made and in fact no new vehicles were required. 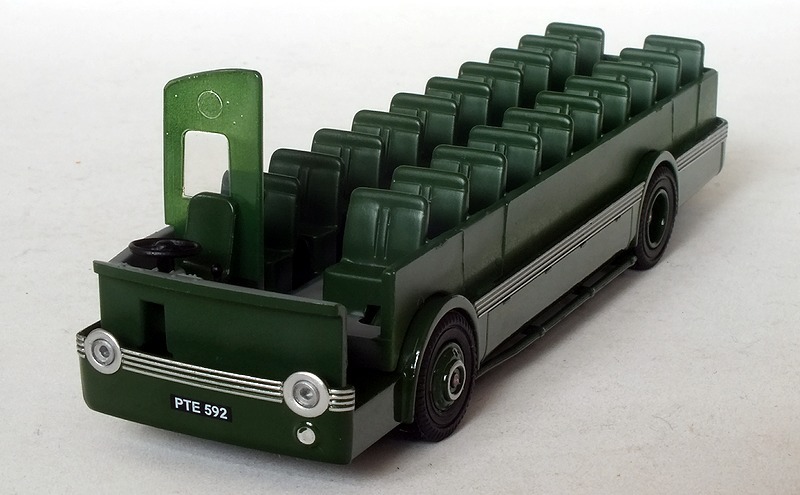 The three experimental vehicles were returned to their owners in April 1954 and no orders were placed. Oxford Diecast Ltd have already produced a versions of the model in Ribble and Maidstone and District versions. The latest model follows their previous practice of a two part plastic casting made to a very high standard. 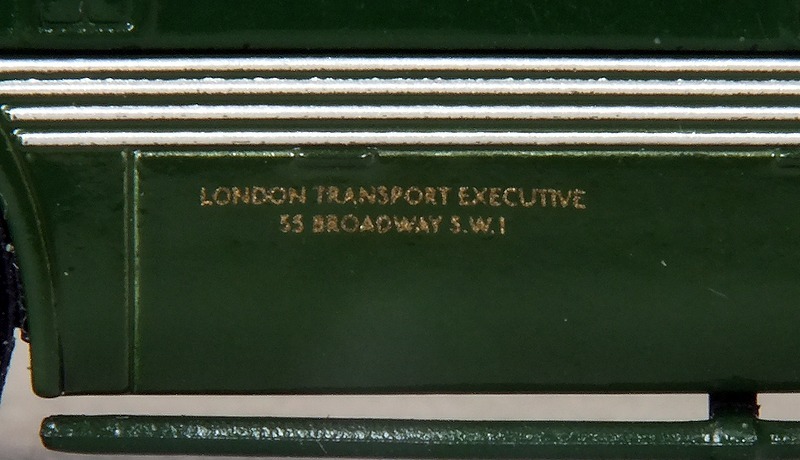 The joint between the sections follows the chromium lining and is hardly visible. 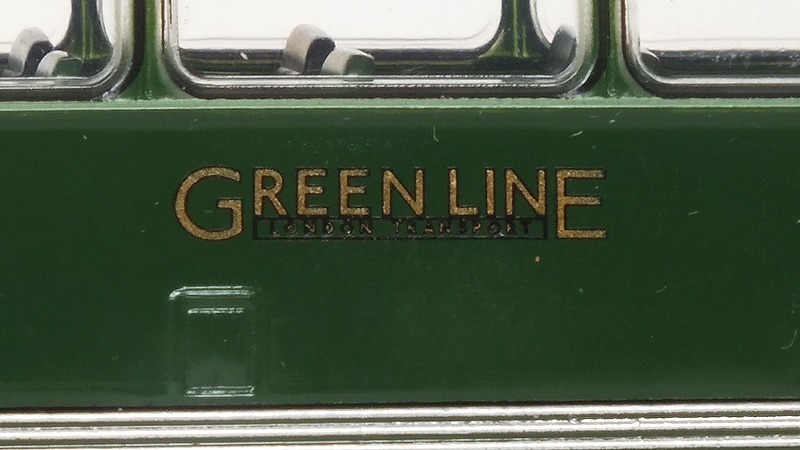 The paint finish in Lincoln green means that the plastic is not translucent and the finish is as good as for any die cast model. The choice of colour is most realistic. I have placed the model beside an early EFE RF and certainly the Saro seems to be more accurate. The interior is a basic moulding. As with previous Oxford models, this could be seen as a minus point. However the price is very moderate compared with some other models with detailed interiors. 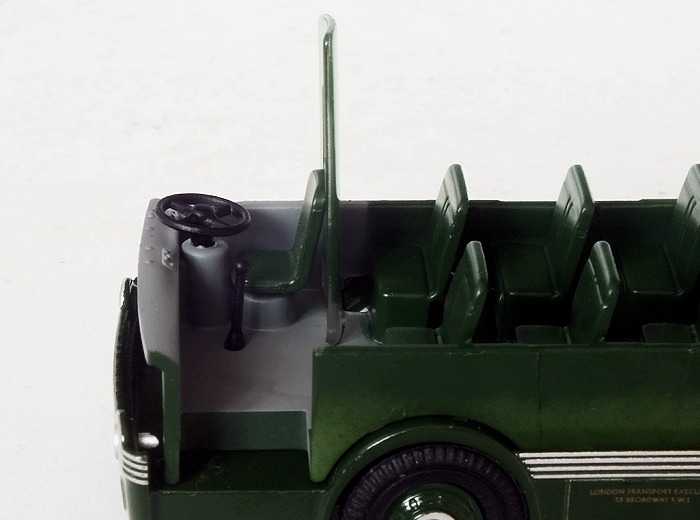 The base can be removed easily so it is possible to paint and add details to the interior. 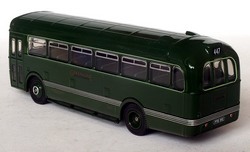 At their introduction, the experimental buses caused a great deal of interest and many photos are available. 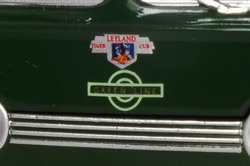 The Saro at different times carried Green Line and London Transport fleet names. 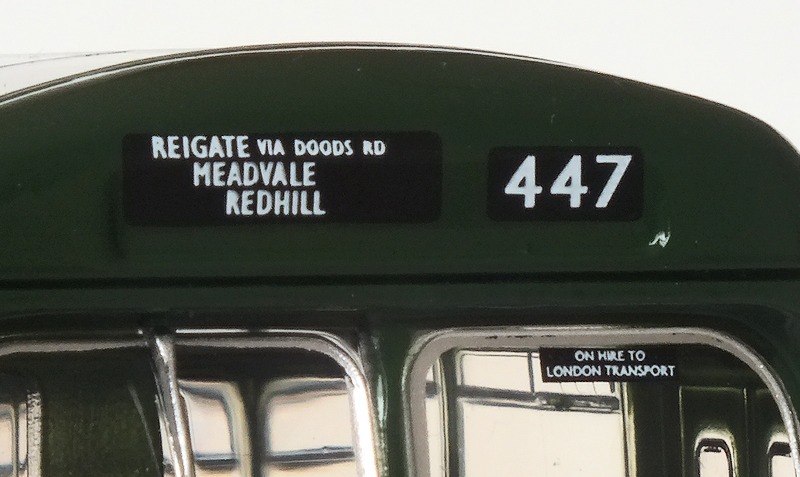 The model carries a Green Line fleet name but blinds for the country area route 447. On matters of detail, the model is very accurate with clear printing. The destination blind shows three lines rather than four: in fairness the destination box was quite small and unless adjusted with care, it sometimes showed three rather than four lines. 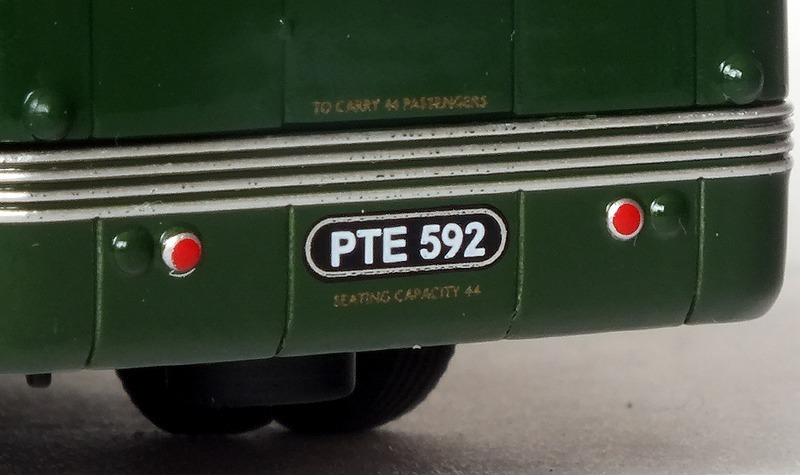 The garage plate and running number appears on the off side but on the near side. Examination of a number of photos shows that this was sometimes the case. The number RG 32 is accurate for use on route 447. Rear light clusters are a problem for many models. It needs to be remembered that the legal requirement for reflectors was only introduced in 1954. 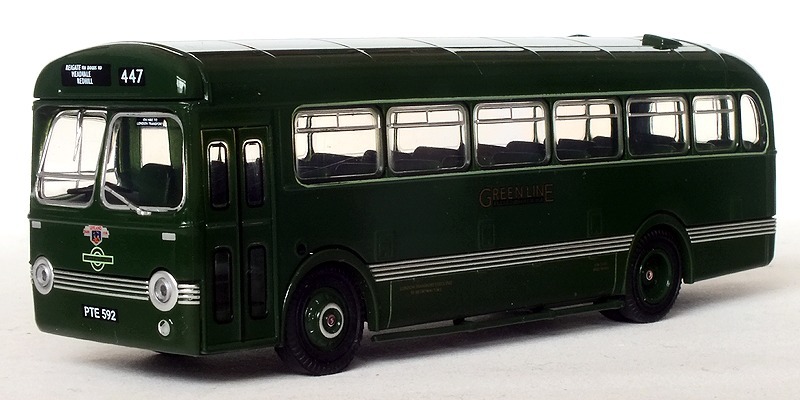 Models which span this period can have mouldings for reflectors which were not part of the original design. 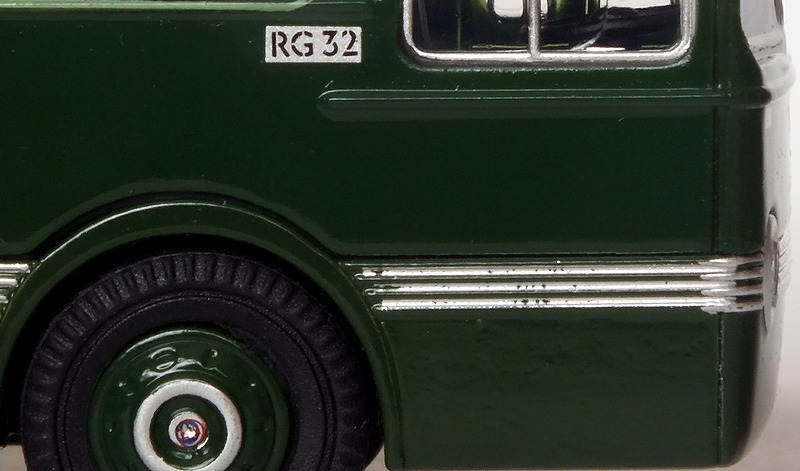 The model correctly shows the two rear lights beside the rear number plate but the mouldings for reflectors for other versions of the model are visible. 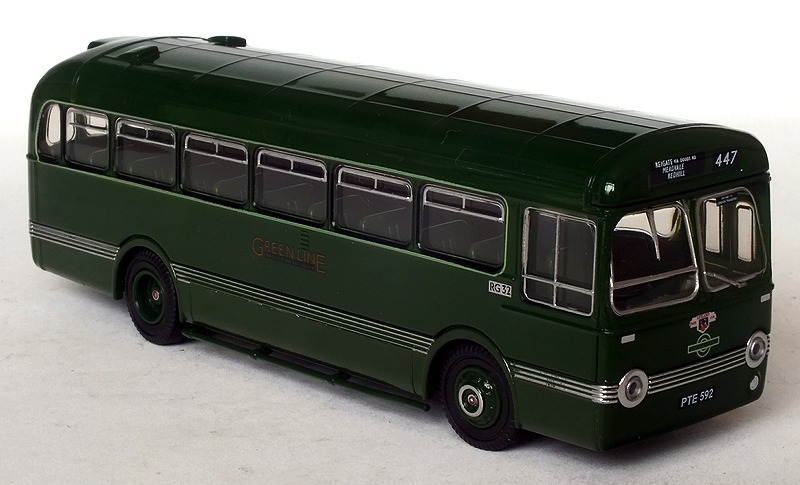 In all this is a very attractive model at a moderate price. 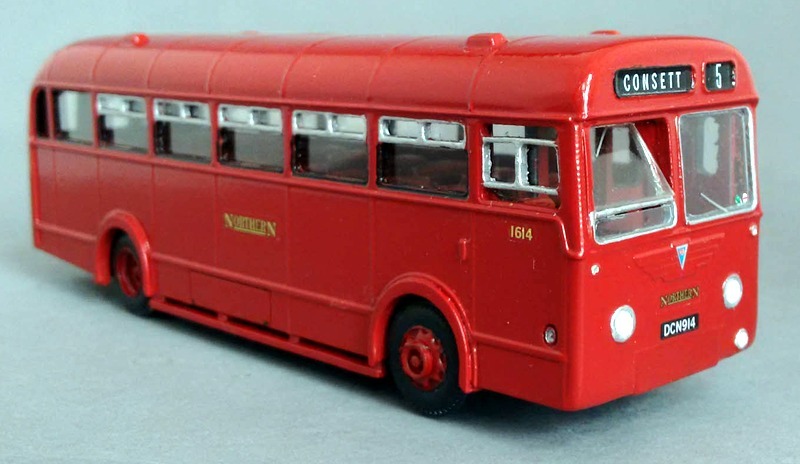 Over the years, models of the majority of the post war London buses have been produced. 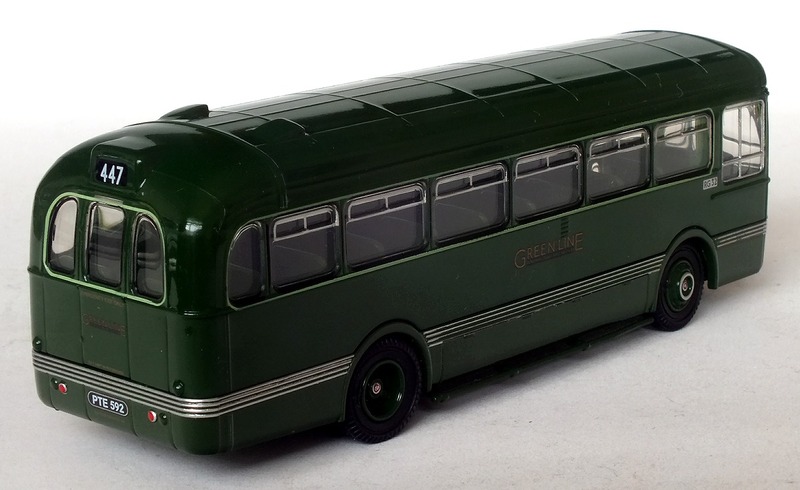 It is good to be able to add some of the rarer vehicle which caused considerable interest when they appeared. We already have the Bristol LS in the EFE. 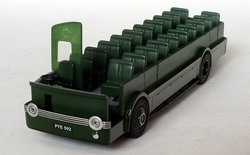 The Little Bus Company have produced a version of the AEC Monocoach. This is now out of stock but it must be hoped that it will be repeated. With latest model from Oxford. The experimental trio is now complete.